Imagine! In 1969, there was something called the Sports & Play Club Plan. The owner of this ticket must have tried to see Dear World on a Saturday night and found it sold out...so they were given an exchange ticket. And only $10 for an orchestra seat to see Angela Lansbury in a Tony winning performance! Dear World, indeed. 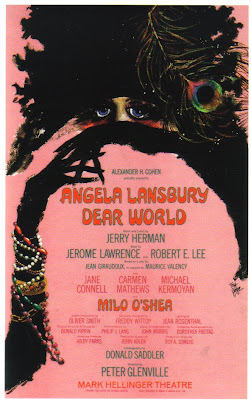 I guess they didn't use it by May 2nd, and unfortunately Dear World closed after only 132 performances on May 31, 1969. I remember seeing an episode of "I Love Lucy" where they were talking about seeing a Broadway show and the tickets were $5. What a beautiful piece of history there! I have part of a ticket stub stapled into my "1600 Pennsylvania Avenue" playbill from Wednesday evening performance on May 5 (day after opening) in Orchestra Right CC 16 for a whopping $15.00!